Over 6 hours of numerous electrifying concerts spanning 3 decades. NTSC DVDs - region 0. 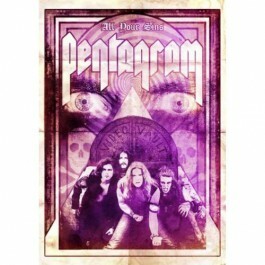 This first-ever official PENTAGRAM video collection, "All Your Sins" recovers, repairs and resurrects the earliest known footage of these doomed metal pioneers and more. It contains two DVDs packed with priceless archive footage, as well as recent shows, "All Your Sins - Video Vault". This definitive collection features numerous historical shows, including a charged performance in 1985 at the legendary CBGB club in New York City, with a mass of classic renditions from the band's catalogue finally gathered together for a live journey spanning over 30 years.